The iPad has certainly become the ultimate gateway to help with my parenting tasks. While I still spend time browsing for new storybooks at my local bookstores, their collections just haven't been updated that often. Similar to how Apple has revolutionized its distribution for the OS X, I believe the App Store and digital downloads for iPad storybook apps are how our future would look like. They are easier to browse and search, and most of the reviews are already integrated into the overall App Store experience. Finding a good storybook app is never an easy thing to do. That's why I will always try to share the ones I find interesting while browsing for my juniors. Several key factors are mandatory, such as good morals, interactivity, artwork and voice over. Some of the apps that we have reviewed in the past have offered other unique features as well, leveraging the features of the iOS platform. 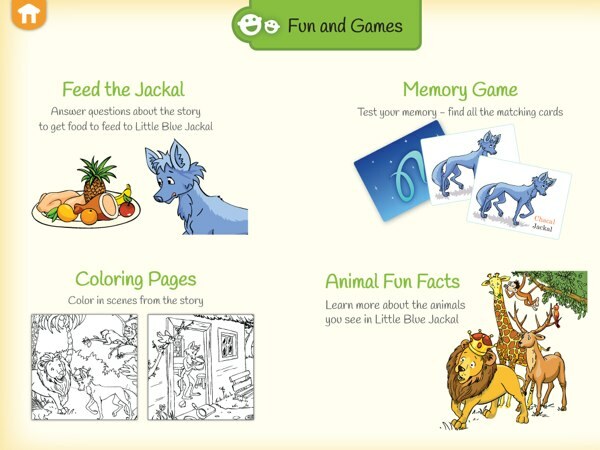 Little Blue Jackal is a storybook app for the iPad whose storyline is taken from an ancient Indian folk tale collection known as as Panchatantra. The collection itself has hundreds of mostly animal fables, and the developer of this app chooses to tell the story of a little jackal. The storyline starts with Little Jackal trying to steal some food in a nearby village. Unfortunately, two dogs caught him in the act and tried to chase him down. Afraid of getting caught by the dogs, he ran and fell into a bucket full of blue paints. When he got up, the Jackal was shocked to see his entire body turned blue. As he returned to the jungle, a monkey spotted him and reported this phenomenon to the Lion, who was the king of the jungle. Upon seeing the Little Blue Jackal, the Lion King was in awe because he has never seen an animal like him. The Lion even surrendered his crown to the Jackal and made him the new king of the jungle. Being the new king, the Little Blue Jackal received royal treatments from the other animals in the jungle. Things were looking good for him until one day, he sent away a pack of other jackals because they were fighting one another. After sending them away, he realized he was lonely. Afterall, he was still just another jackal. He howled into the night, waking up the other animals - including the Lion. Realizing that the new king was just another jackal, the Lion was furious and took the crown back from the Blue Jackal. He was sent away from the jungle and back to the villages to look for food. The app has what it takes to be a solid storybook app, such as good storyline, good morals, good interactivity (where your juniors can tap selected items on each page to learn what their names are), and other activities related to the story. Mini games such as card matching, quiz about the storyline, coloring sheet and animal fun facts are included to keep your juniors active. In each scene, there is always a pair of birds, respectively named Tweety and Chirpy, following the blue jackal everywhere he goes. These birds have a strong personality and add a unique flavor to the storytelling. Tapping on each bird will give unique commentaries on how they view the event that took place. Tweety: Why is he running so fast? Sleeping is more fun. Chirpy: Sing Sing we have a new Blue King! Tweety: Singing is too harsh on my vocal cords. Chirpy: Tweety, we will never fight. We are best friends forever. Chirpy: Why do jackals howl? Tweety: The better question is, when will he stop howling. Another unique feature of this app is the sleep mode. Using this mode, you don't need to swipe through the pages to listen to the story. The app will automatically play the recorded voice over continuously without showing you the visuals. This is perfect if you want the story to be played just before your juniors go to bed. They would not have to be distracted with the visuals, they just need to listen to the audio and prepare for sleep. Little Blue Jackal is a solid storybook app that tells a folktale that we may not be too familiar with. With the widespread adoption of the internet, I expect to see more folktales from around the world to be translated into English and be distributed via the App Store such that more people would be able to enjoy them. Having a good moral story that "how we look does not change who we really are" really helps us as parents to deal with the impending teen culture that our juniors would face. If you favor storyline and life values over illustration and animation, I highly recommend this app.